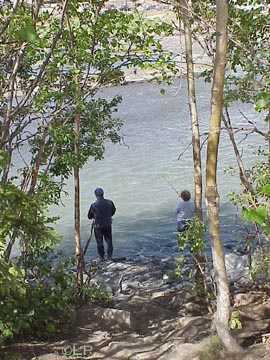 Fishermen line both banks and stand in the bed of Ship Creek as they try to land king salmon in the June salmon derby. The 1999 derby winner landed a salmon weighing 41.8 pounds. Once you've reached Alaska, there's no problem finding a place to fish. There are streams, rivers, lakes and, of course, the ocean. There are plenty of choices of types of fish to go after, too: red, pink, silver, king and chum salmon, freshwater and saltwater trout, and halibut, to name just a few. If you like crowds, combat fishing on a stream near Anchorage or on the Kenai Peninsula may be just the thing. 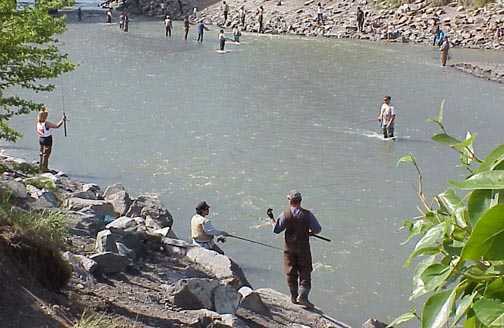 When the salmon are running, fishermen stand shoulder to shoulder along these rivers that are easily reached by road. Chartering a boat to go deep sea fishing for halibut, which sometimes weigh more than 400 pounds, is one way to get away from the crowds. Chartering a floatplane for a trip to a remote stream or lake is another. If you do that you might find that the only competition is a grizzly bear. That could lead to another kind of combat fishing -- but probably only if you don't surrender your catch to any bear that shows an interest in it. The likelihood of encountering bears at Ship Creek, where the above photos were taken, however, is vanishingly small. 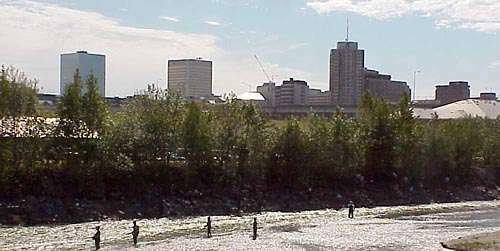 For this salmon stream is in the heart of Anchorage. The nearest motel is just across the road, and downtown Anchorage is just up the hill. The photos on this page were taken on the last day of the Ship Creek King Salmon Derby in June 1999. About 325 fish weighing a total of 8,000 pounds were entered in the 10-day Derby.